In the 1st century Ephesus was the capital city of the Roman province of Asia. Known as “the first and greatest metropolis of Asia,” the most celebrated feature of the city was the Temple of Diana, counted as one of the Seven Wonders of the World. This temple was apparently a rebuild of a previous shrine to an ancient fertility goddess which burned in 356 BC. It was also distinguished for its theater, the largest in the ancient world, capable of seating 20-25,000 spectators. Fights between beasts and men with beasts were staged here. Ephesus was a port city in Western Asia Minor at the mouth of the Cayster River. Mountains surrounded the town on three sides and the sea was on the west. It was famous for its trade, art, and science. Ephesus enjoyed the height of its prosperity in the first and second centuries a.d. as the fourth largest city in the Empire. Religion was of paramount significance to the city of Ephesus. Scholars agree that the primary god of this region was the mother goddess of the Anatolian people who originally peopled this territory. The area was first colonized by Ionian Greeks under the leadership of Androclus of Athens in the tenth century b.c. The Greeks identified the deity with their own Artemis, but the attributes remained those of the ancient fertility goddess. Over time the city became the cult center of the worship of the Ephesian Artemis. Artemis (or Diana, according to her Roman name) was known variously as the moon goddess, the goddess of hunting, and the patroness of young girls. She was the twin sister of Apollo and the daughter of Zeus. When called upon to do so, the city would vigorously defend the goddess against impious detractors [see Acts 19.28]. Artemis was not the only deity in Ephesus. Ephesus’ religious climate was similar to that of many other large cities in the Greek East. There is documentation—including literature, epigraphy, numismatics, sculpture, and architecture—of a plethora of Greco-Roman and, to a lesser extent, Anatolian deities. These include Aphrodite, Apollo, Egyptian gods, gods most high, Hercules, Pluton, & Zeus (among others). They also engaged in hero worship, with a cult devoted to Alexander the Great existing until the 2nd century AD. Into this intensely pagan society the gospel is preached. The history of Christianity in Ephesus began about AD 50, perhaps as the result of Priscilla and Aquila (see Acts 18.18). However, on the day of Pentecost, there were residents from various parts of Asia minor who heard and no doubt were obedient to the gospel (Acts 2.9). Perhaps the earliest roots stretch back to the very beginning of the church. Nevertheless, most scholars point to Paul’s brief stay on his second missionary journey (Acts 18.19-21) as the nexus of the church. 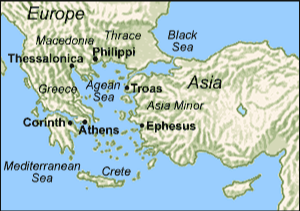 During his third missionary journey Paul reached Ephesus from the “inland country” (Acts 19:1), i.e., from the highland parts of Asia Minor, and stayed there for about three years, Paul’s longest missionary tenure. So successful and abundant were his labors that “all the residents of Asia heard the word of the Lord Jesus, both Jews and Greeks” (19:10). Influence from this resident ministry undoubtedly established congregations in the Lychus River Valley at Laodicea, Hierapolis, and Colossae. Scholars also believe he wrote 1 Corinthians from Ephesus and perhaps Romans. Ephesus continued to play an important role in early church history. “The consensus of 2nd century sources is in favor of placing John in Ephesus in latter years.” A long of bishops in the Eastern church lived there. Council of Ephesus in AD 431. This is undoubted an epistle of Paul and those who would deny Pauline authorship stand on very thin ground. The writer identifies himself as “Paul” (1.1; 3.1) who is both an apostle and prisoner of Christ. Further, the similarities between this epistle and Colossians is striking—75 of 155 verses can be connected (in similar form) to Colossians. By the mid-second century, the epistle is in wide circulation and undisputedly considered of Paul. Early church writers (Clement, Ignatius) quote from this epistle. Early canons (Muratorian, Marcion) include this epistle as being of Paul. Scholars overwhelmingly affirm that this epistle was written by Paul during his Roman imprisonment between AD 62-64. When it comes to the recipients, the case is not as cut-and-dry. For one, there are no terms of endearment (Beloved, friends, etc.) which is typical for Paul’s epistles to people he has met and known (i.e Philippians 2.12). Also, the language hints that Paul did not personally know (1.15, “I have heard of your faith”) and who do not seem to know Paul (3.2, “assuming you have heard”). This could not be a description of the Ephesian church. Paul had experienced their love while he had lived among them and he had declared to them his ministry from the Lord Jesus Christ (see Acts 20.24). The external evidence is mixed with some early church writers (Irenaeus, Clement of Alexandria, Tertullian) citing this epistle as “to the Ephesians” while other early church writers (Origen, Jerome, Basil) had copies of this letter without the words “in Ephesus” in them. The majority of manuscripts contain the phrase en Epheso but the earliest (Beatty, Vaticanus, Sinaticus) do not (though Sinaticus has pasi en Epheso in the margin). This has led some scholars to conclude that this epistle is actually a circular letter to the various churches in Asia Minor. While addressed to “the saints who are faithful,” Ephesus would have been the first stop of this “book tour” since it was the port city, the gateway Asia Minor. Over time, this epistle was recognized as primarily belonging to Ephesus. Paul writes to explain to his brethren that God has equipped Christ’s church with every spiritual blessing to grow.